Examination of the child with asthma in the absence of an active exacerbation is usually normal. Chest auscultation during an exacerbation may reveal diminished intensity breath sounds, a prolonged expiratory phase, and polyphonic high-pitched wheezing heard diffusely throughout the chest. If the exacerbation is severe, the chest may be silent with poor intensity breath sounds due to low flow rates; this is an ominous sign. If the wheezing is isolated to a single lobe, an alternative diagnosis such as foreign body aspiration should be considered. Other findings on examination supportive of atopy might include nasal congestion with edematous turbinates and pale dusky mucosa, clear rhinorrhea, bluish discoloration under the eyes (“allergic shiners”), and eczema. If digital clubbing is present, a diagnosis other than asthma should be pursued such as suppurative lung disease, bronchiectasis, or cystic fibrosis. The pathophysiologic hallmarks of asthma include airway inflammation, hyper-reactive airways, and airway remodeling. The airway's hyper-reactivity or reversible airflow obstruction can be documented in a variety of ways. Pulmonary function testing prior to and after bronchodilator use is commonly done in children age 4 years and older (Figure 1). In children younger than age 4 years, auscultation documenting improvement or resolution of wheezing after inhalation of a bronchodilator is also supportive evidence. For children with complaints of cough or wheeze who are not wheezing at the time of the clinic visit, a trial of short-acting bronchodilators at home may document the improvement to support an asthma diagnosis. Challenge testing may be used to document reversible airflow obstruction and can be achieved by methacholine, exercise, or cold air challenges; these are usually only done in sophisticated pulmonary function-testing laboratories. (A) Time-volume curve. The blue line is prior to taking albuterol and the red line is after 4 puffs of albuterol. (B) Flow-volume curve. Expiration is the top loop and inspiration is the bottom loop. The blue expiratory loop appears concave with regard to the volume axis, suggesting airway obstruction. 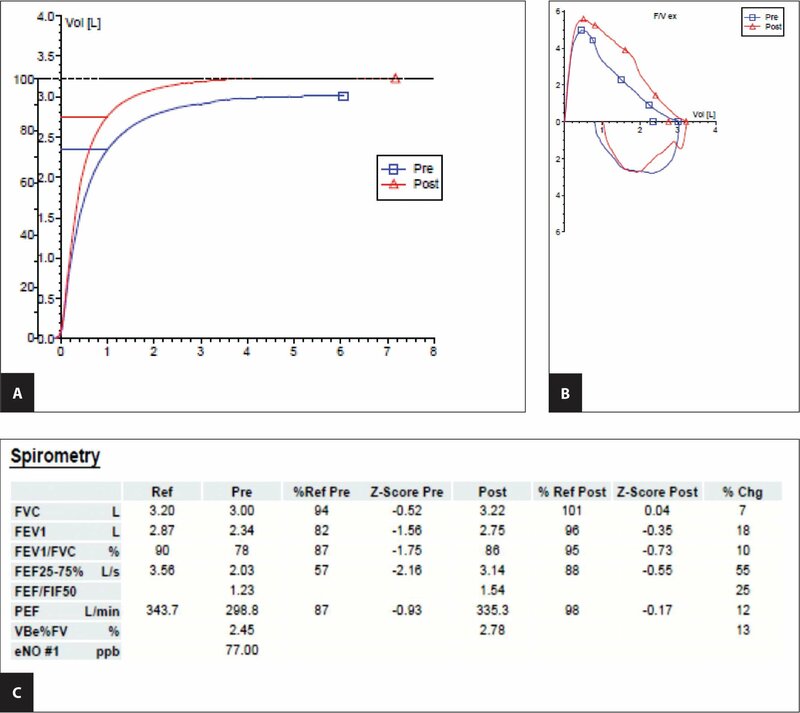 (C) Pre- and post-bronchodilator spirometry numerical values demonstrating reversible airflow obstruction. The pre-bronchodilator FEV1/FVC and FEF25-75% are reduced (below the Z-score −1.64), consistent with obstruction. There is an 18% increase in the FEV1 and a 55% increase in the FEF25-75% after bronchodilator use and all values normalize post-bronchodilator. The eNO #1 is the fractional excretion of exhaled nitric oxide and is elevated (normal is <25 parts per billion for a child older than age 12 years), suggesting allergic airway inflammation. % Chg, the percent change in the value after bronchodilator; %Ref Pre, percent of predicted prior to albuterol; % Ref Post, percent predicted after bronchodilator; FEF25-75%, forced expiratory flow between 25% and 75% of the vital capacity; FEV1, forced expiratory volume in the first second; FVC, forced vital capacity; PEF, peak expiratory flow rate; Post, value measured after bronchodilator; Pre, value measured before bronchodilator; Ref, predicted value; VBe%FV, percent back extrapolation; Z-score, number of standard deviations from the mean. Children may present with symptoms that are not obvious manifestations of asthma. The classic triad of cough, wheeze, and dyspnea may not always be present, and some children may only have a dry cough. Children with cough-variant asthma have similar triggers (viral infection, exercise, allergen, irritants) and also respond well to asthma medications but typically do not respond to antibiotics or antihistamines. Exercise or methacholine challenge testing demonstrates bronchial reactivity identical to classical asthma. 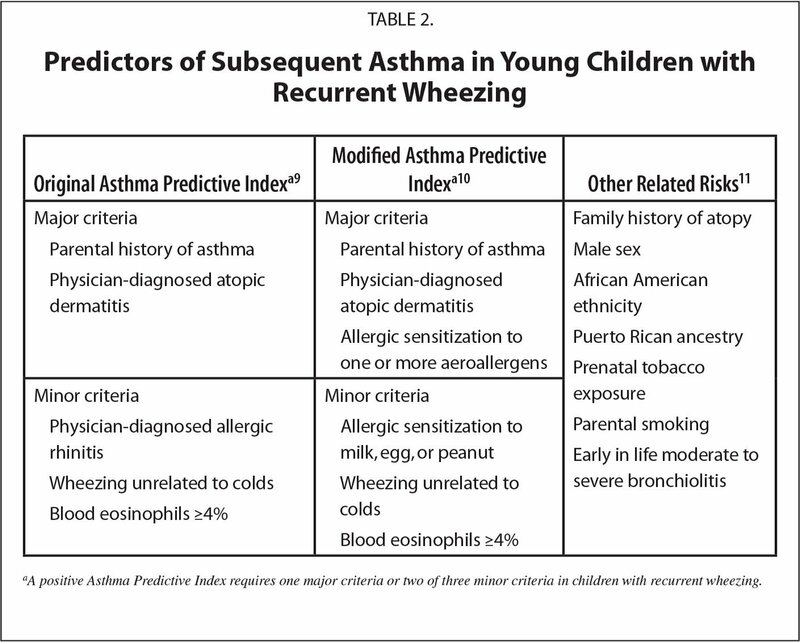 Another less obvious presentation of childhood asthma is recurrent pneumonia. The usual history of this presentation is that of a viral upper respiratory tract infection associated with fever, cough, perhaps wheezing, and an opacity on the chest radiograph. The examination may demonstrate both wheezing and crackles. The constellation of respiratory symptoms, abnormal auscultation, fever, and radiographic abnormality is often labelled pneumonia and treated as though it is a bacterial pneumonia. The viral infection, however, causes both the fever and the asthma exacerbation, which then causes mucus plugging and atelectasis, which account for the radiographic abnormality. These children may have cough with other triggers besides viral infection, including excessive nocturnal coughing and exercise intolerance, which is a clue that asthma is the underlying issue. A chest radiograph with diffuse increased peri-bronchial markings and over-inflation may also support a diagnosis of asthma (Figure 2). To help identify asthma as the reason for the recurrent pneumonia, one should seek a history with typical asthma presentations including a high asthma predictive index, positive family history, personal history of atopic diseases, and other nonviral triggers. A comprehensive evaluation for other causes of recurrent pneumonia that fails to identify an alternative explanation is also supportive of asthma. Treating these children for persistent asthma often ameliorates the episodes of recurrent pneumonia. Frontal (A) and lateral (B) chest radiographs of a 2-year-old child with an acute asthma exacerbation due to rhinovirus and coronavirus showing diffuse bilateral increases in peri-bronchial markings and overinflation. These are the most common radiographic findings in children with an acute asthma exacerbation. There are no segmental opacities, pleural effusions, or cardiomegaly. There is a left-sided aortic arch (normal). Chest pain is an often-overlooked manifestation of asthma. Chest pain or dyspnea with exertion, even without accompanying cough or wheeze, may be caused by exercise-induced bronchospasm. This can be documented by an exercise challenge study. Managing the asthma usually helps resolve the symptoms. Children with chest pain from heart disease usually have a history that suggests a cardiac problem or an examination that raises appropriate concern. An exercise challenge test is usually diagnostic, and treatment with a short acting bronchodilator often improves the symptoms. Recurrent cough and wheeze are frequently encountered in small children, so it can be challenging to determine if there is an underlying predisposition for asthma. Many physicians are still taught that the diagnosis of asthma cannot be made until the child is age 3 or 4, or even 5 years, which is clearly an outdated concept. Viral illnesses commonly make children without asthma wheeze, with bronchiolitis being the classic example. The diagnosis of acute bronchiolitis and asthma may not be mutually exclusive, and a single episode of bronchiolitis increases the child's risk of subsequent wheezing with viral infections.13,14 Although the response to inhaled short-acting bronchodilators is absent or minimal with acute bronchiolitis, there may be a good response with subsequent viral-triggered wheezing, which supports a diagnosis of viral-triggered asthma. Recurrent viral-triggered asthma in young children is controversial and challenging to manage. Despite many attempts to identify the best approach to these children, one has not been found.15,16–18 The number of exacerbations, oral steroid bursts, emergency department visits, and hospitalizations seems to be the same whether the children are treated with daily inhaled corticosteroids, intermittent inhaled steroids, or have their dose of inhaled steroids increased during illnesses. These children may benefit from an asthma specialist consultation to help confirm the diagnosis, exclude alternative diagnoses, and individualize a treatment plan. Once the diagnosis of asthma is established, an attempt should be made to estimate the severity for the purpose of matching the appropriate intensity of therapy with the severity of asthma (ie, a step-wise approach).5 Asthma is considered intermittent if symptoms occur twice a week or less, if night cough is twice a month or less, and if rescue albuterol is used twice a week or less. A short-acting bronchodilator such as albuterol may be all that is required for children with intermittent asthma. Asthma is considered persistent if the symptoms are more frequent than intermittent, and daily controller therapy should be offered for children with persistent asthma. The preferred initial controller therapy for mild persistent asthma is low-dose inhaled corticosteroids (ICS), although leukotriene modifiers may be an acceptable alternative for daily controller therapy. The intensity of therapy is increased if asthma control is not achieved within a few months. Guidelines recommend consultation with an asthma specialist for children younger than age 3 years who have persistent asthma and all children with persistent asthma who require at least two controller medications or medium- to high-dose ICS.5 Initially, children should be seen routinely for follow-up about every 3 months to reassess asthma control; this interval can be extended once control is assured. Step-down therapy should only be considered after full asthma control is established for 3 or more months.5 The obvious goal is to keep the child's asthma controlled with the least amount of medication needed. Despite the advances in our understanding of asthma pathobiology and the increased numbers of medications available to improve asthma control,22 acute asthma exacerbations continue to occur frequently.2 More than one-half of children with self-reported asthma in 2016 had an asthma attack in the prior year, 16.7% had an urgent care or emergency department visit, and 4.7% were hospitalized.2 The most common etiology of these asthma exacerbations is acute viral infections. As our understanding of the risks for exacerbation improves, it may be possible to intervene sooner to reduce this burden on the children, their families, and the health care system.23 Currently, the most successful options to treat acute exacerbations are oral or systemic steroids,24 short-acting bronchodilators, and supportive care such as supplemental oxygen. Childhood asthma remains a common problem despite much improved understanding in the disease pathobiology and advances in treatment options. Although traditional asthma is often easy to recognize in school-age and older children, more obscure presentations can make it challenging to identify asthma as the cause of the child's symptoms. 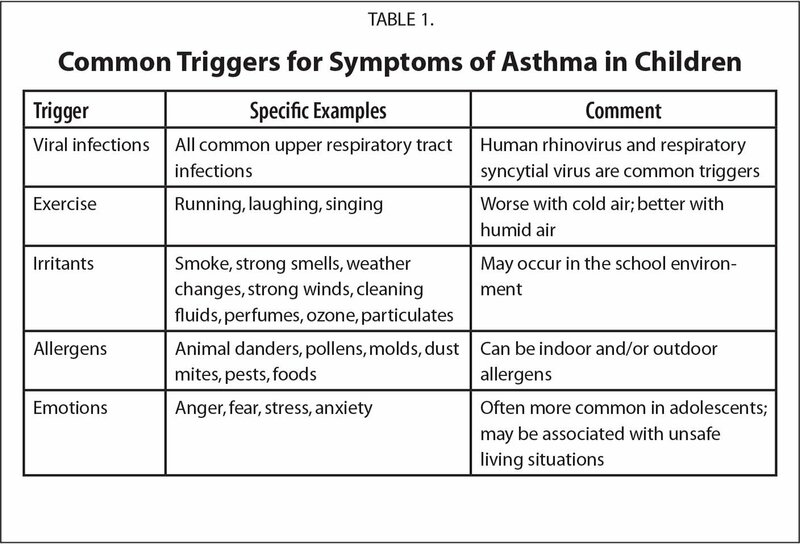 The diagnosis of asthma in preschool children with wheezing is both challenging and controversial. The intensity of recommended therapy should match the severity of the asthma and be escalated until satisfactory control is achieved. After control has been achieved, step-down therapy can be considered. The prognosis for childhood asthma is generally good, but children with asthma that is difficult to control might benefit from specialty consultation. Centers for Disease Control and Prevention. Most recent asthma data. https://www.cdc.gov/asthma/most_recent_data.htm. Accessed February 16, 2019. National Heart, Lung, and Blood Institute. Guidelines for the diagnosis and management of asthma. (EPR 3). https://www.nhlbi.nih.gov/health-topics/guidelines-for-diagnosis-management-of-asthma. Accessed February 16, 2019. Global Strategy for Asthma Management and Prevention--Updated 2018. https://ginasthma.org/gina-reports/. Accessed February 27, 2019. Heather E. Hoch, MD, MS, is an Assistant Professor. Paul R. Houin, MD, is a Clinical Instructor. Paul C. Stillwell, MD, is a Senior Instructor. All authors are affiliated with the Department of Pediatrics, University of Colorado School of Medicine, Anschutz Medical Campus; and Pediatric Pulmonology, Cystic Fibrosis, and Sleep Medicine, Children's Hospital Colorado. Address correspondence to Paul C. Stillwell, MD, Children's Hospital Colorado, 13123 E. 16th Avenue, Mail Code B395, Aurora, CO 80045; email: Paul.Stillwell@childrenscolorado.org. Disclosure: Heather E. Hoch has served as a consultant for Astra Zeneca. The remaining authors have no relevant financial relationships to disclose.